[XPB-BXXWBP-X] This Athletic Sports Wire Mesh Bench is constructed of galvanized steel with expanded wire mesh metal seats. Each seat is 12" Deep and come in a multitude of choices. Wire metal benches are finished in Thermoplastic, a durable weather resistant finish, and available in 16 color choices (See Color Selects). 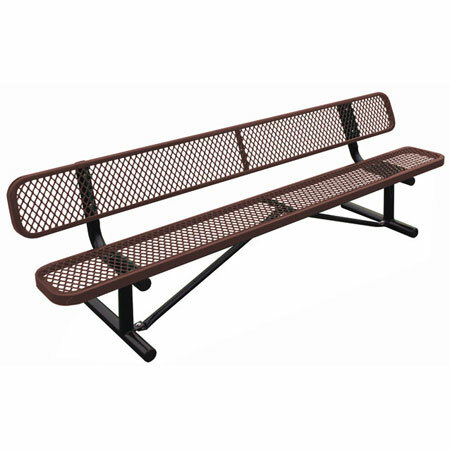 Wire mesh bench is available in 4 ft., 6 ft., 8 ft., 10 ft.and 15 ft. lengths. Choose from three (3) mounting styles, Portable, Surface Mounted or In-Ground ideal for indoor or outdoor use .Anti-Skateboard protectors available but sold separately. Compliment your bench with matching Receptacle sold separately. For shipping quotes, discount pricing, orders or questions please call our Customer Service Center at 1-877-483-9270.